The Civil Rights Movement hits full stride in 1963. In 1963, the Civil Rights Movement commands national and international headlines. Rev. Martin Luther King leads months of protests in Birmingham . . . and keynotes the massive March on Washington that brings 200,000 civil rights supporters to the Lincoln Memorial. This is the year that Martin Luther King writes his "Letter from Birmingham Jail," an eloquent defense of non-violent confrontation in the pursuit of civil rights. 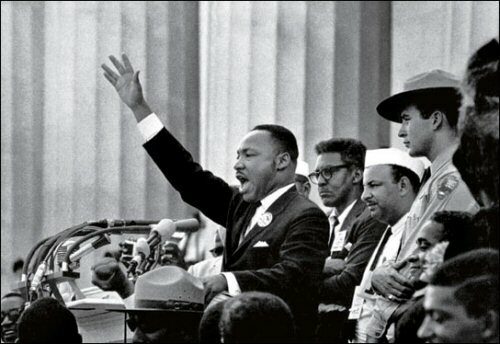 On August 28, he delivers his famed "I Have a Dream" speech at the March on Washington. Throughout the nation, hundreds of civil rights protests challenge long-established patterns of segregation and discrimination. 1963 is a year of protest marches • demonstrations • voter registration drives • lunch counter sit-ins • church kneel-ins • attempts to integrate public schools, colleges, and universities • motels, stores, restaurants • theaters, amusement parks, bowling alleys, swimming pools, beaches, summer camps. 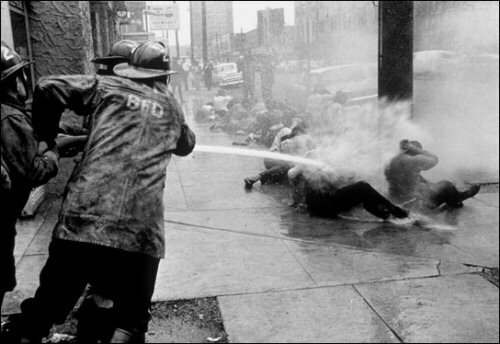 Thousands of civil rights protesters are arrested • many are assaulted with high-pressure fire hoses • shocked with electric cattle prods • beaten, by police as well as angry white mobs • segregationists bomb black churches and homes of black leaders. Activists are murdered . . . as are innocents. The names of Sunday School pupils Denise McNair, 11; Carole Robinson, 14; Addie Mae Collins, 14; and Cynthia Diane Wesley, 14 who are murdered when someone bombs the 16th Street Baptist Church in Birmingham, Alabama, on Sunday, September 15 are seared into the nation's conscience. Note: It would be 37 years before two suspects were found guilty of the crime; two other suspects died before they came to trial. The months-long civil rights protests in Birmingham led by Rev. Martin Luther King, Rev. Fred Shuttlesworth and Rev. Ralph Abernathy. The murder of Medgar Evers in Jackson, Mississippi. The August 28 March on Washington.